I’m happy to announce our six itty-bitty redbud transplants have survived my shovel and winter. Momma Redbud is beside herself, her blooming branches spread in praise of her offspring. There’s nothing more entertaining and economical for a gardener than plant reproduction right under her nose. Spring—the fecund season when trees, shrubs, and perennial flowers yield more than enough sprouts to share with like minds and trowels. This kind of conversation begins with the first sighting of skunk cabbage in March, revs up in April when the white bloodroot blooms, and peaks with white and red trillium in honor of Mother’s Day. May—flower fever month when perennial exchanges flourish throughout subdivisions and garden clubs. Yesterday morning, for instance, in a brief spell of congeniality the sun accommodated plant enthusiasts who were glad to swap their wealth with a neighbor’s. One gardener’s stone is another’s emerald. Yet, swapper beware. There’s a plethora of hosta varieties from variegated to giant, some 70 inches wide. It’s a good idea to know what variety you’re adopting. All volunteers are not created equal. Horticulture plays by its own rules. 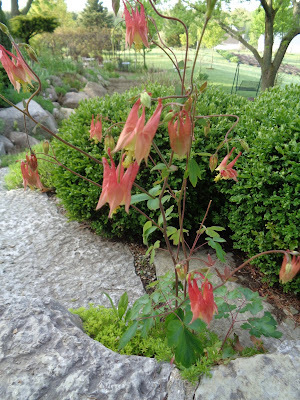 Like hostas and bleeding hearts, some flower species know boundaries, others don’t. Plant Lily of the Valley and Solomon Seal in the same bed with your hybrid tea roses and you’ll gnash your teeth some fine day in May. Those lilies are eating alive my white rosa rogusa, a rather hardy bush. Invasive—a term I’ve learned after a good neighbor offered me liberty to dig up pink and white Lily of the Valley from her hillside. Naturalized is a kinder word for the lily condition that plagues my rosa rogusa, yet describes the perfect ground cover under my mother’s lilacs which are in full bloom. As in any pursuit, learning is in doing. Making mistakes and correcting them. I cede. A lily must behave like a lily. A rose, a rose. What about the deer, the damage to our gardens and trees? Is all my labor in vain? Hallelujah! I think Uncle Luke’s Feed Store in Troy has provided a natural remedy. DEER SCRAM. Yepper! And me, dear Reader, an Appalachian offspring transplanted in Michigan? I am a volunteer, a blow-in from Irish ancestors who must dig, plant, and bloom where I am rooted. By the way, I found three Redbud volunteers while weeding my perennial island today. I’m beside myself. Shall I swap or keep?